"Morning, gentlemen. Nice day for murder." Here he's teamed up with Pat O'Brien, his great pal, and maybe the best onscreen priest in movie history. O'Brien plays Jerry, boyhood best pals with Cagney's Rocky; we meet them as boys, trying to boost fountain pens from a train car in the yard. Jerry is just a step quicker, and gets away, while Rocky gets snared and sent to juvie—it's almost as if that one moment was the crucible for the formation of both their characters. Jerry becomes a man of the cloth, while Rocky becomes the scourge of New York; still and all, they've got a friendship and a history that's stronger than any societal obstacles that might come between them. The action really kicks in when Rocky, fresh out of the stir, goes to see his attorney, Frazer—the mouthpiece has $100,000 of Rocky's money, and the gangster wants it back. Frazer has other ideas, however, and puts a hit out on Rocky. 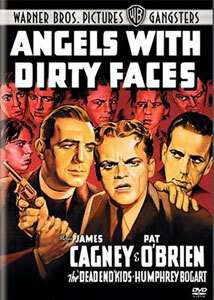 As great as Cagney is with O'Brien, in many ways here he's better with Humphrey Bogart, who plays Frazer, because their characters are going at it, not hashing out old times, and here, Bogart's screen persona wasn't as nuanced as it became in the following years. At this point, the definitive Bogart performance was as Duke Mantee in The Petrified Forest, and the actor brings all of that menace with him to this movie. Presiding over the affair is director Michael Curtiz, who even in the time of auteur theory is underappreciated—in fact, he worked with both Cagney and Bogart again, directing each of them in what may be their hallmark performances (Yankee Doodle Dandy and Casablanca, respectively). The classic set-up between the bad man and the priest sets up a battle, and the territory at stake are the souls of the young toughs in the neighborhood, played by a group known collectively as the Dead End Kids. Father Jerry has been trying to bring them into the light, but they're mesmerized by Rocky, his legend, his guns, his money. In truth the work of this group of young actors isn't the strongest aspect of the picture—Curtiz has emphasized the dese/dem/dose aspect of their speech, and while they're very busy cracking wise, we never really come to know them. Part of that is stylistic, but part of that is logistical—that is, there are a whole lot of them (with names like Bim, Swing, Hunky, and Pasty), and there's no point in trying to keep track. Less brassy but still not quite as strong as the main action is the relationship between Rocky and Laury, played by Ann Sheridan; a childhood friend of Rocky's and Jerry's, she lost her husband to mob violence, and despite herself is falling for yet another man on the wrong side of the law. Curtiz has a crackerjack eye for action, and the climactic shootout is pretty spectacular stuff; there's a decidedly Expressionistic feel to the photography, too, with the actors frequently lit sharply and starkly from below, moody images through broken glass, and establishing shots of smoky stairwells from a menacing, high angle. Even more affecting is Cagney's final haunting scene, which I won't describe in too much detail so as not to give away the plot for the uninitiated; still, it's one of the most harrowing and intentionally ambiguous sequences in any gangster picture, and it alone would ratify Cagney's status as one of the great ones. Image Transfer Review: Cagney may be forever young on screen, but the same can't be said for the print of this film, which displays evidence of decay�the original black-and-white photography still looks sharp, but there's been some dulling down, discoloration and acid damage with the years. It's far superior to what you may have seen on television, but it doesn't sparkle. Audio Transfer Review: You'll hear the hiss and pop typical of a mono track of this vintage, but the dialogue is clear throughout. Extras Review: Warner has provided a solid set of extras, appropriate to this high-profile title. USC film professor Dana Polan has recorded a spirited, informative commentary track�he wisely emphasizes Curtiz's fascination with the power of images, and in many respects this is a movie about the media, and the influence of popular culture on the lives of ordinary people. He also provides a pretty thorough production history, including much parrying with the Hays Office, and reflects on the influence exerted by this and other gangster pictures of the period�the vocabulary for every screen mobster clear through to Tony Soprano was established by Cagney and his performance here. High marks to Professor Polan, who has done an excellent job. Leonard Maltin is on hand to provide an introduction (04m:17s) to Warner Night at the Movies, an effort to re-create what the moviegoing experience might have been like for the original audience of Angels. The package (31m:30s) features a trailer for Boy Meets Girl, a comedy starring Cagney and O'Brien—it's "a bangup barrage of mirth," sources say. Up next is a newsreel, featuring Neville Chamberlain embodying appeasement, and Technicolor two-reeler, Out Where the Stars Begin, about an ingénue looking for her big break on the Warner backlot. And I bet you can't guess who stars in the cartoon, Porky & Daffy. Whadya Hear? Whadya Say? (22m:14s) features a parade of film historians and critics (among them: Rudy Behlmer, Drew Casper and Andrew Sarris) commenting on the movie, its principal actors and director, and its place in the history of gangster films. Finally, there's the Lux Radio Theater version of the story, first broadcast on May 22, 1939; Cecil B. De Mille is your host, Cagney and O'Brien reprise their screen roles, with Gloria Dixon in for Ann Sheridan (no Bogie in this one), and the original ads for Lux toilet soap: "Its active lather does a thorough job of cleansing." A swell and stylish gangster picture from Warner's golden age in the genre, featuring iconic performances from Pat O'Brien, a young Humphrey Bogart, and especially James Cagney, under the able, unobtrusive direction of Michael Curtiz. It's a definitive picture in the genre, and has been ably turned out for this DVD with a smart, informative package of extras. All in all, as Rocky would say, it's a pretty snappy-looking dish of a DVD.